Later this month, on May 23, the United States Mint will begin selling its annual proof American Buffalo gold coin featuring James Earle Fraser’s famous design that was first used on the 1913 Buffalo Nickel. Today, the U.S. Mint confirmed that later this year it will also offer a special reverse proof version to commemorate the 100th anniversary of Fraser’s design. "This special edition of the coin celebrates the centennial anniversary of the American Buffalo design by James Earle Fraser first featured on the Type I Buffalo (or Indian Head) nickel in 1913," the Mint said. Fraser’s design features a profile of a Native American on the obverse and a reverse depicting an American Buffalo, also known as a bison. A reverse proof features a mirror-like finish on top designs elements instead of on backgrounds as seen on traditional proofs. An on-sale date is not yet established, but the reverse proof’s price will be determined using the standard U.S. Mint pricing matrix for numismatic gold coins. Also, its mintage will be fixed by collector demand. While sold separately, the reverse proof American Buffalo gold coin will ship in the same wooden box as the traditional proof. The outer box, though, will instead feature a leather-like material to make it easily recognizable as a different product. 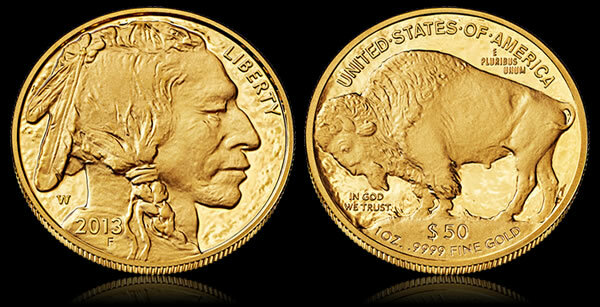 The above traditional proof American Buffalo Gold Coin launches on May 23, 2013. $50 American Buffalo gold coins are struck from one ounce of 24-karat, or 99.99% pure gold. They have a diameter of 1.287 inches and a thickness of 0.116 inches. Each is minted at the United States Mint facility at West Point. Bullion version for investors and proof versions for collectors have been issued annually since 2006. A collector uncirculated version was also released in 2008. All the collector coins, including the upcoming reverse proof, carry the "W" mint mark. Bullion coins do not. I know the regular proof buffalo is striking but I’m not sure a reverse proof buffalo will be anywhere near as striking as the regular proof is. It’s easy to see details when the image is frosted and not so much when it’s polished. And with the large expanse of mirror finish on the reverse proof I’m thinking the little bit of frosting isn’t going to make a whole lot of difference. One question will this coin have a mintage limit? Will it be a one time deal like the high relief or are they trying to test market it to see about doing it in future? If it were a one time deal it would be neat. I would say its a one time deal. Its a special edition centennial anniversary of the type 1 buffalo nickel bubba. I wish I had some extra cash. As I said above I’m not enamored with the reverse proof coins and am already over budget for this year so putting out another $1800+ for this coin is beyond me too. And while they may do something similar in 2016 for the gold buffalo 10th anniversary this coin may end up being a sleeper (as the first of it’s kind) since it’s coming out later in the year and if (as the trend is shaping up) they confine sales to one month. As there have already been Reverse Proof coins Minted in American Eagle Gold, Silver and Platinum I would not bet that this will be the “One and Only” Reverse Proof Buffalo ever minted. My bet would be with JIM and another RP Mintng for the 10th Anniversary (i.e. a 2 coin set). It will, however, be the First RP Buffalo to be Minted and being so will be a Key coin for both “Buffalo” and “First” collectors. It will be the only type 1 reverse proof ever minted. There will not be another one. I don’t understand. All the buffaloes are based on the type 1 nickel and this will indeed be the first reverse proof buffalo, buy why do you say there will not be another one? You know something the rest of us don’t? I don’t remember seeing anything about changing the buffalo design or there being a type 2, etc. This will be the only buffalo on a mound. Made only in 1913. Type 1 raised ground. Type 2 flat ground. I would think the next reverse proof will be type 2 flat ground. But, who knows. Sorry I didn’t explain myself very well. I was watching hockey playoffs. ADD. The two most dangerous words in the English language are “Always” and “Never”. Runners up are “I think” and “I believe”. Who would have imagined 100 years ago (in 1913) when the buffalo was issued (as the Buffalo Nickel) that within 100 years it would be reissued as “One Troy Ounce Silver Coins” and as “One Troy Ounce Gold Coins”. Types aside these may again be issued for the 150th or 200th anniversaries. That is to say if coins are not “Always” around (and not electronically represented) and that they will “Never” again be issued in some other format (palladium anyone?). Who cares about the most dangerous words. jim you know what i’m talking about now? I understand the difference between types now. 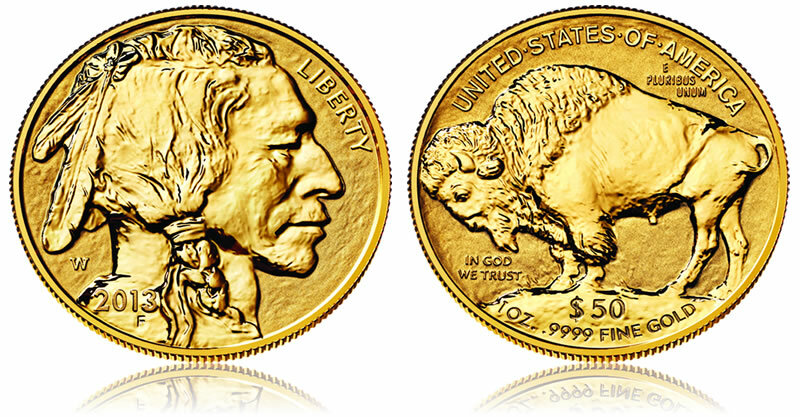 I still don’t understand why you think the type 1 buffalo gold coins will no longer be offered after 2013. The next reverse proof will be a type 2 that’s what I mean. The rest of them will be type 1. It only makes sent’s. How do you know that the next reverse proof will be a type 2? Who said that? Where did you read that? As far as I know all buffaloes have been and will continue to be type 1.
jim – I don’t think you understand the difference between types yet. It’s a centennial special edition which was a type 1 buffalo. Why would the mint make two type 1 reverse proofs? That’s if they make a second reverse proof. Remember the mint only made one gold eagle reverse proof for year 20 in 2006 so far. Your distinction between type 1 and type 2 was mound or no mound, right? I understand that. By the end of this year we will have had 4 silver reverse proofs with no changes in the design of the coin. Just because it’s been done once doesn’t mean it can’t be done again. jim – It will defeat the whole purpose for a “centennial special edition type 1 buffalo”. That’s why if they do it, the next reverse proof would be a type 2. And there is a lot more silver than gold to play with. That’s why there is more silver reverse proofs and burnished silver eagles every year. Remember the mint only made one platinum and gold eagle so far. Lets wait and see. What’s unique about this coin is it’s date (and it’s a reverse proof). In 2016 all bets are off with a new date. Personally I don’t believe they will use a different design as they haven’t with the silver coins. But obviously you do (I suspect it’s only because there was a type 2 design even though they’ve never used it). Like you say, let’s wait and see, in 3 yrs time. hi jim, iv*e been looking over these past years blogs, & this set of blogs about this subject, has been maintained in *my mind from time to time, more so when the *u*s*mint, mints a new one every year, now that it’s past the three year mark, and there has not been another reverse proof of this coin minted ***yet***, & a type 2 for that matter, dose not mean it will never happen, *i know it’s just *me saying this, but if they ever get around to minting a type-2 reverse proof of this coin, *my opinion, that it will go over *big, for all the right reasons, that *i will *not get into, no need to explain my*self, lets just have nature & our *mint take it’s course, nothing more, nothing less, enjoy the collection you have, as *i do with mine, *peace.